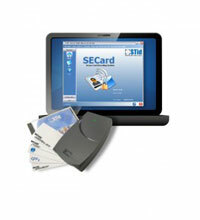 The SECard encoder kit provides a secure and easy-to-use software platform for creating, configuring and managing your own private smartcard-based door access card encoding format, based on the STid range of MIFARE/DESFire door access readers such as the ARC-A. This kit includes a secure USB desktop reader and matching software for Windows, which enables administrators to create their own encrypted data format for card numbers stored on MIFARE Classic, DESFire EV1 and various other card technologies. The encoding information can then be transferred to compatible STid readers through the use of programming cards, while the software also offers a quick and easy card encoding function for the creation of user cards.